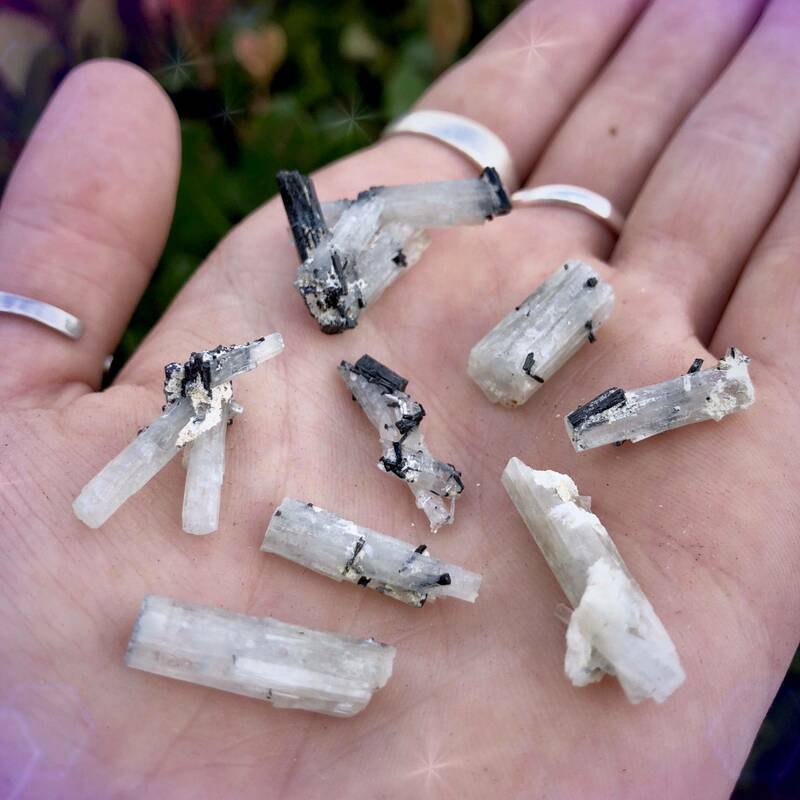 These 333 Crystals are goshenite with black tourmaline and they bring to mind Angel Number 333 – the number that appears when the Ascended Masters are near. 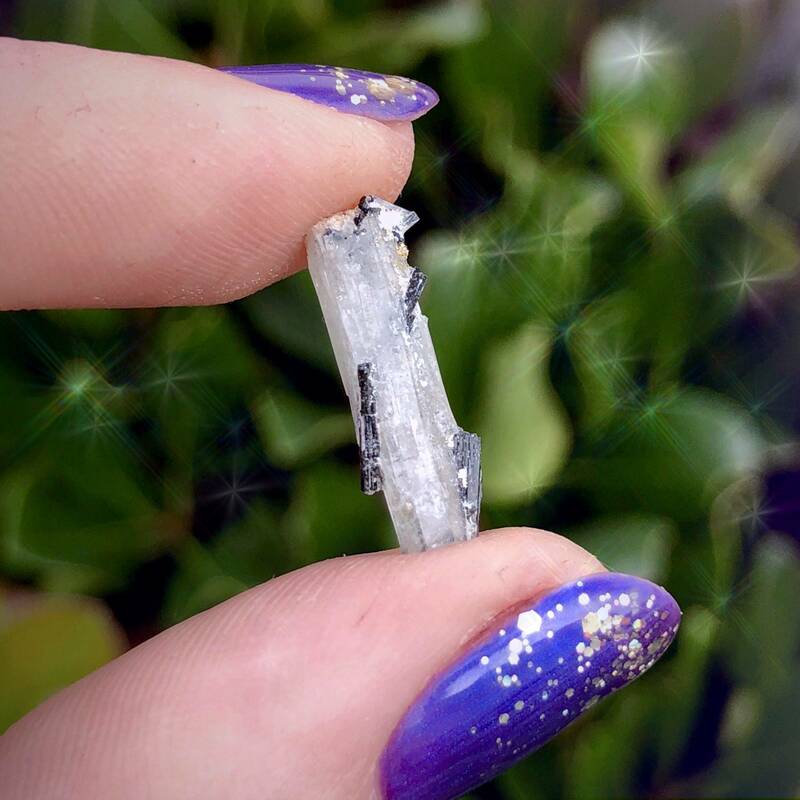 A stone of the White Ray, goshenite powerfully calls forth Spirit, connects you to the Ascended Masters, and deepens your relationship to your highest, most authentic self. Black tourmaline is powerfully grounding and stabilizing, yet its vibration is gentle and comforting. It helps you stay centered as you work with the upper chakras and Higher Realms. To add to the magic, each of these 333 crystals has been anointed with my 333 Perfume. When you see 333, it is a sign to you that you are capable of overcoming any obstacles in your path. Even now, you are conceiving life and birthing what has not yet come to life, and life always wins. Love always wins. 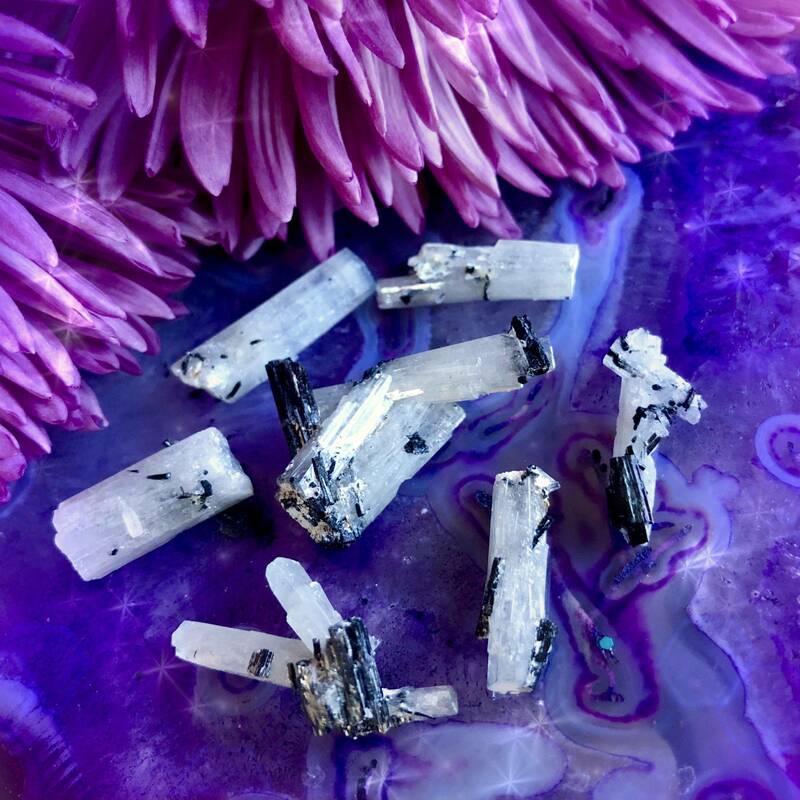 Work with these 333 Crystals to connect with your guides and angels to fully receive this message and attune to its frequency. If you want to learn more about angel numbers and communicating with the angelic realm, check out our Angel Numbers webpage and Angel Numbers classes. Goshenite is calming and healing to the mind, connecting you more closely to Spirit. It raises all surrounding vibrations, frees you from low energies, improves dreams, and promotes general peace and calm. It throws your Crown Chakra wide open and brings you closer to Source and the Divine. Black tourmaline is a powerful talisman of protection, resonating with the Root Chakra. Tourmaline is one of those gems that works overtime, keeping you protected from negative energy, transmuting low vibrations into high vibrations, and shielding you from harmful radiation from electronic devices. It is also known to boost the immune system and increase alertness. These 333 Crystals serve as a reminder of how stones that appear to be opposite in magic, actually work together powerfully to serve your Highest Good. Hold your piece to your Crown Chakra, or lie down and place it above your head during meditation. As you do so, envision the light of the White Ray bringing you the clear sight and spirit connection you’ll need to align with your Highest Good. Feel the energy of the black tourmaline holding you and keeping you safe as the White Ray washes over you. May these 333 Crystals bring you ethereal peace as you work with them; may they bring you closer to who you are, and who you always have been. This listing is for one (1) 333 Crystal, about 0.5-1” in size. Yours will arrive lovingly parceled along with a single leaf of white sage and a card describing the properties of the stone.